Are you ever tempted by an email or an ad claiming you can “earn a college degree based…on life experience”? Don’t be, say attorneys for the Federal Trade Commission (FTC), America’s consumer protection agency. Chances are good that the ad is for a “diploma mill,” a company that offers “degrees” or certificates for a flat fee, requires little course work, if any, and awards degrees based solely on life experience. Most employers and educational institutions consider it lying if you claim academic credentials that you didn’t earn through actual course work. Federal officials say it’s risky behavior: If you use a so-called “degree” from a diploma mill to apply for a job or promotion, you risk not getting hired, getting fired, and in some cases, prosecution. Flat Fee. 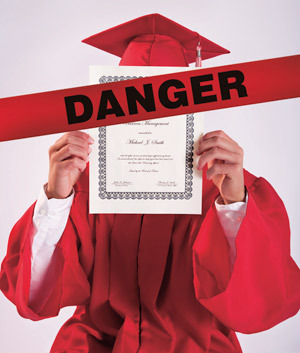 Many diploma mills charge on a per-degree basis. Legitimate colleges charge by the credit, course, or semester, not a flat fee for an entire degree. No Waiting. Operations that guarantee a degree in a few days, weeks, or even months aren’t legitimate. If an ad promises that you can earn a degree very quickly, it’s probably a diploma mill. email or pop-up ad, it may be a diploma mill. Legitimate institutions, including distance learning programs, won’t advertise through spam or pop-ups.